exclusively at Chotto Matte from 27th April until 28th May, in honour of the Japanese festival of Sakura. The Hibiki Cherry Blossom is a luxurious and fragrant cocktail created from a harmonious blend of Hibiki 12 year old whisky, Prucia plum liqueur, sweet vermouth and cherry bitters, served over ice. Suited to whisky lovers and new connoisseurs alike, Hibiki’s unique taste profile and characteristics are enhanced by the carefully selected cocktail components and a handcrafted ice-ball. subtleties found within the 24 seasons of the old Japanese lunar calendar, making it the perfect drink to celebrate Sakura, the season of Cherry Blossom. 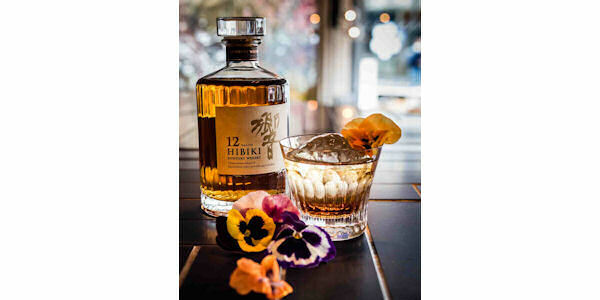 This Spring, Suntory will bring a taste of Japan to London with a delicately crafted Hibiki 12 year old cocktail, complete with edible flowers. Hibiki 12’s complex tasting notes are formed during a meticulous process, where select components of whiskies from Suntory’s main distilleries, Yamazaki, Hakushu and Chita, are carefully blended, before being delicately flavoured in an Umeshu, sweet plum, barrels during the aging process. food and drink offerings to reflect the seasons, with Sakura being one of the most prominent. Sakura is a traditional Japanese festival that celebrates the colourful bloom of the Cherry Blossom tree. After the short opening of the blossom, thousands of petals fall from the trees in a theatrical display of beauty. A national sign of hope, the Cherry Blossom that falls across Japan during Sakura represents rebirth and the beauty of life. Chotto Matte, is a Japanese restaurant and sushi bar located in the heart of London’s Soho. Fusing traditional clean lines with a more underground Tokyo style, it is the perfect place to pair Japanese Whisky with Japanese Cuisine. 28th May during the Sakura season, priced at £10. Blossoming. Exuberant. A dazzling, echoing, roundness.